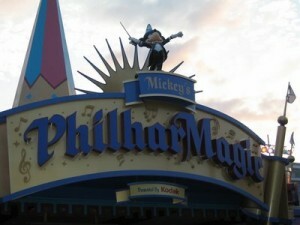 Attraction Description: Mickeys Philharmagic can be found in Fantasyland at the Magic Kingdom. This 3D film features many of your favorite Disney characters including Mickey, Donald, Jasmine, Aladdin, Ariel, Simba, and Peter Pan. The movie is just about 12 minutes long and is a fabulous attraction that will appeal to all the members of your party. Tips: Fastpass is available for this attraction, but the theater holds close to 500 guests so you may not need to use this option. This attraction is held in a dim and cool theater and is a nice respite from the heat of Fantasyland. I find this to be a great attraction for both parents and children touring Fantasyland. It is a great mix of new and old characters that will surely make everyone smile! Many of the original artists of movie characters such as Luminere and Belle came on board to assist with Mickey’s Philharmagic. This entry was posted in Attraction Spotlight, Fantasyland, Magic Kingdom, Uncategorized and tagged 3D, fantasyland, guide, magic kingdom, mickey, movie. Bookmark the permalink.